The orange and white parachute of Soyuz TMA-08M colored the blue-gray morning skies of Central Kazhakstan today, as NASA astronaut Chris Cassidy, along with cosmonauts Pavel Vinogradov and Alexander Misurkin, returned to Earth following a five-and-a-half month stay aboard the International Space Station. The Soyuz craft pushed back from the station’s Poisk module at 7:35 p.m. EDT (23:35 UTC) Tuesday, formally kicking off Expedition 37. The trio cruised out of the outpost’s vicinity and executed a de-orbit burn at 10:05 p.m. Just 53 minutes later at 10:58 p.m., the Soyuz plopped down safely on the Kazakh steppe. 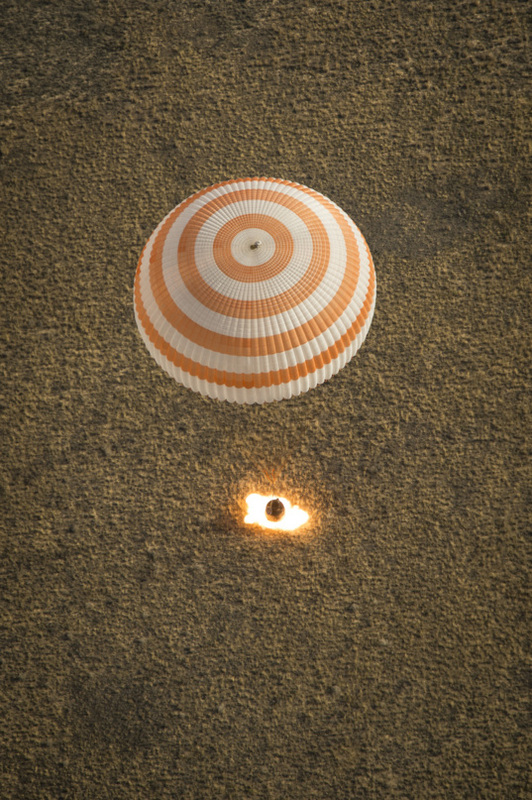 Soyuz TMA-08M, carrying the crew of Expedition 36, touches down on the Kazakh steppe on Sept. 11, 2013. The bright orange flash under the vehicle is caused by retro-rockets firing to slow the spacecraft's descent. Pavel Vinogradov formally handed command of the station over to Fyodor Yurchikhin on Monday. Yurchikhin, along with NASA’s Karen Nyberg and the European Space Agency’s Luca Parmitano, will crew the station until NASA astronaut Mike Hopkins and cosmonauts Oleg Kotov and Sergey Ryzansky arrive on Sept. 25 in Soyuz TMA-10M. Pavel Vinogradov hands command of the station over to Fyodor Yurchikhin on Monday. Yurchikhin, along with NASA’s Karen Nyberg and the European Space Agency’s Luca Parmitano, will control the station until the next crew arrives on Sept. 25. Before the next crew arrives, the station is scheduled to receive another visitor: Orbital Sciences Corporation’s Cygnus spacecraft. Like SpaceX’s Dragon, Orbital’s Cygnus is a commercial resupply spacecraft. Its first station visit will be a demonstration flight. Cygnus is expected to launch atop an Antares rocket on Sept. 17, with arrival and berthing scheduled for Sept. 22. It will mark the second flight of Antares, which successfully put a Cygnus mass simulator into orbit on April 21. 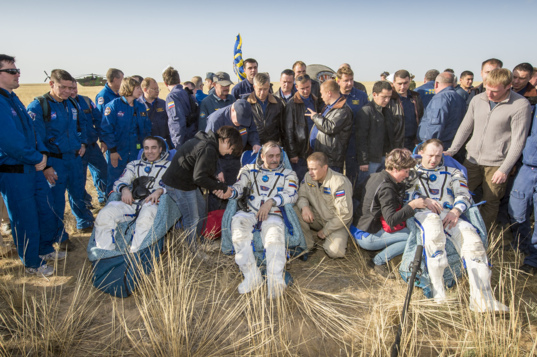 Chris Cassidy (left), Pavel Vinogradov (center) and Alexander Misurkin (right) are examined by a support crew after landing in their Soyuz TMA-08M capsule in Kazhakstan on Sept. 11, 2013. Was the translator/interpretor Elena Kozhukhov from your 07/24/2013 blog? I don't think that was her doing the change of command, no. She said they switch off every half hour, which is apparently a normal practice for interpreters because the brain needs a break when doing continuous real-time interpreting. But that reminds me: Elena was going to help me compile a Soyuz launch cheat sheet, so hopefully I'll get that going by Sept. 25.